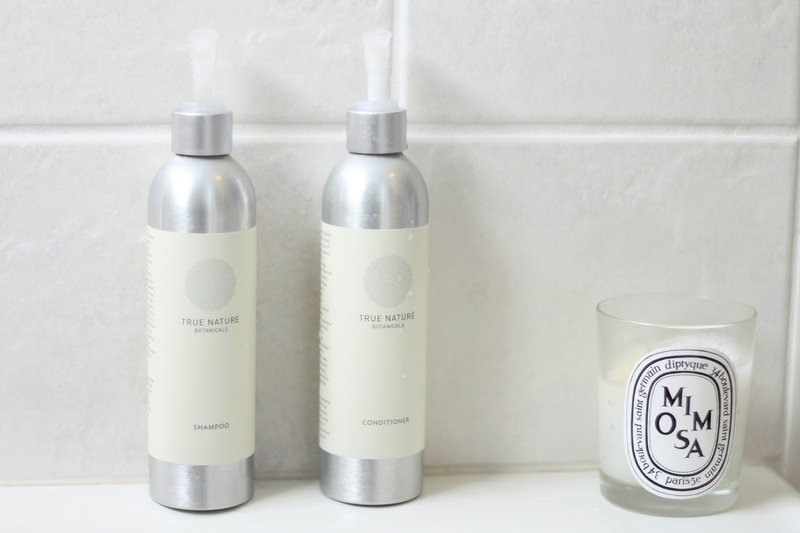 My weekend of hair loving continues with another brand new launch from an established (and personally beloved, on my part) green beauty brand. The gorgeous True Nature Botanicals has never let me down before (throwback posts here, here and here) and I honestly let out an audible squeal when I read that they were adding haircare to their brand. They've added a shampoo and conditioner to their line just this past week, and after using each of them for a few weeks now I'm ready to share my thoughts...well, let's be honest, I'm ready to share my absolute raves. These products are beautiful - as soon as I opened the box I was just in love with the design and simplicity of the bottle. I know that's not necessarily important, but I just feel it's a detail that needs to be added. Let's start with the Shampoo*, which uses ingredients such as green tea oil, meadow foam seed oil and aloe leaf powder to keep your hair and scalp clean and moisturized. Since I have oilier hair I usually get a bit nervous when using a shampoo that doesn't outright claim itself as "balancing" or "volumizing" because, for me, that usually equates to limp locks. I'm happy to report that is not the case with this shampoo, which somehow manages to keep my hair cleansed and clean feeling while still keeping it hydrated and healthy. I'll admit that it doesn't leave my hair particularly voluminous, but it doesn't leave it limp either. It does leave my hair feeling lighter and shinier, leaving the option open for a bit of salt or texturizing spray to give my hair a bit more oomph. While I find the shampoo fairly hydrating and nourishing on its own, I really love the brand's new Conditioner* enough as well that I do tend to use it on a near daily basis. The great news? It does not leave my hair feeling oily as so many conditioners tend to do. Most conventional conditioners use silicones and mineral oils, which not only irritate my scalp but leave my hair looking like a gross, oily mess. The natural ingredients in this conditioner (which include aloe powder, green tea oil and macadamia seed oil) leave my hair unbelievably soft but never weigh it down. In fact I feel that it perfectly complements the conditioner, helping to hydrate the ends of my hair without causing it to get oily afterwards. The two products work hand in hand and leave your hair feeling (and smelling) better than ever before. Have you guys had the chance to try out these new gems yet? I can't wait to hear everyone's thoughts!